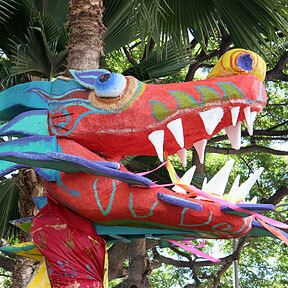 COLORFUL GUARDIAN: This dragon statue stands guard at Kukui Tower, on the corner of North Kukui Street and Nuuanu Avenue. The statue is a symbol of the community's effort to reclaim their neighborhood, and it will be dedicated in a blessing ceremony today. » Statue to honor '99 UH football team?